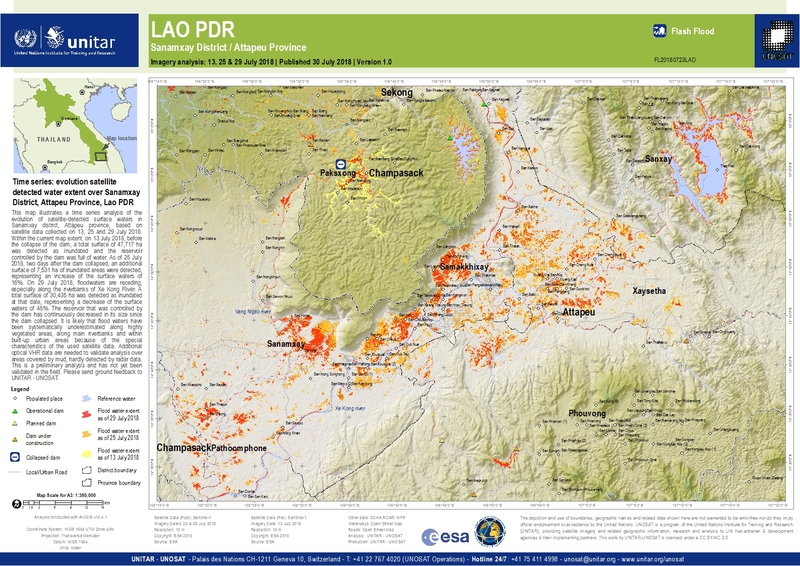 This map illustrates a time series analysis of the evolution of satellite-detected surface waters in Sanamxay district, Attapeu province, based on satellite data collected on 13, 25 and 29 July 2018. Within the current map extent, on 13 July 2018, before the collapse of the dam, a total surface of 47,717 ha was detected as inundated and the reservoir controlled by the dam was full of water. As of 25 July 2018, two days after the dam collapsed, an additional surface of 7,531 ha of inundated areas were detected, representing an increase of the surface waters of 16%. On 29 July 2018, floodwaters are receding, especially along the riverbanks of Xe Kong River. A total surface of 30,435 ha was detected as inundated at that date, representing a decrease of the surface waters of 45%. The reservoir that was controlled by the dam has continuously decreased in its size since the dam collapsed. It is likely that flood waters have been systematically underestimated along highly vegetated areas, along main riverbanks and within built-up urban areas because of the special characteristics of the used satellite data. Additional optical VHR data are needed to validate analysis over areas covered by mud, hardly detected by radar data. This is a preliminary analysis and has not yet been validated in the field. Please send ground feedback to UNITAR - UNOSAT.